Last night we decorated gingerbread houses with our neighbors. 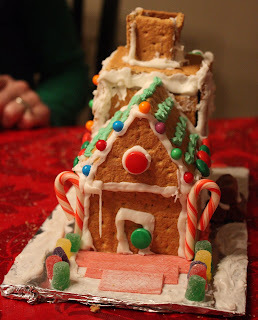 Some made their houses out of real gingerbread, some brought pre-made kits and most used graham crackers. We had green, red and white frosting all with decorating tips and all sorts of candies to choose from. It is fun to see what creative things people come up with. Encourage your children to count out their candies, sort them in colors, or create a pattern (red, white, red white). Who would've thought that such an educational activity would involve candy and frosting.